Interstate 475 is a bypass and commuter route in the Toledo metropolitan area. Looping west from I-75 at Perrysburg, the freeway crosses the Maumee River into the city of Maumee. Proceeding north. I-475 heads through Holland along the west side of Toledo to connect directly with the U.S. 23 freeway to Ann Arbor, Michigan near Sylvania. The remainder of I-475 travels east back to I-75 near Downtown Toledo. Cardinal directions on I-475 change from east/west to north/south once the freeway turns southward along side U.S. 23 at Sylvania. Photo taken 09/02/05. 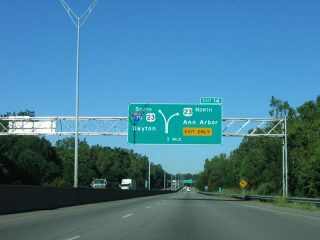 The first appearance of Interstate 75 signage on eastbound Interstate 475 is at Exit 19, Central Avenue. I-75 travels north to Detroit and south to Downtown Toledo. Photo taken 09/02/05. The last mainline exit along Interstate 475 eastbound is for Central Avenue. Photo taken 09/02/05. The left lane of I-475 east connects with Interstate 75 north to I-280 and Detroit, while the right three lanes transition onto southbound I-75. Photo taken 09/02/05. Interstate 475 partitions into the ramps for Interstate 75 and nearby Exit 203B for U.S. 24 (Detroit Avenue). Photo taken 09/02/05. The ramp connecting Interstate 475 east to I-75 north separates with a ramp (Exit 205A) for Jeep Parkway and Willys Parkway. Photo taken 09/02/05. Advancing north by Downtown Toledo, I-75 north reaches the exchange with Interstate 475 west in two miles. Photo taken 09/02/05. The left three lanes connect with westbound Interstate 475 beyond the ensuing off-ramp for U.S. 24 (Detroit Avenue). Photo taken 09/02/05. Interstate 475 leads west from Exit 204 to combine with U.S. 23 at Sylvania, U.S. 23 enters Ohio south from Ann Arbor, Michigan. Photo taken 09/02/05. Interstate 475 travels six miles west from Exit 204 to the exchange with U.S. 23. Photo taken 09/02/05. A directional T interchange connects I-75 north with Interstate 475 west at Exit 204. Photo taken 09/02/05. The original button copy signs at I-475 west were replaced with a diagrammatic sign between 2002 and 2005. Photo taken by Don Hargraves (08/02). A left side ramp (Exit 205A) for Jeep and Willys Parkways precedes the north end of I-475 from Interstate 75 southbound. Photo taken by Don Hargraves (08/02). A lane drop occurs at the upcoming exchange (Exit 204) with Interstate 475 west to U.S. 23. Photo taken by Don Hargraves (08/02). Traveling south on Interstate 475 and U.S. 23, the freeway turns sharply east after crossing the Maumee River. The second to final exit connects with Ohio 25 south to Bowling Green. Ohio 25 is the old alignment of U.S. 25 between Toledo and Cygnet. While there are other state maintained sections of Old U.S. 25, most of the route in Ohio is locally maintained. Photo taken 09/02/05. Southbound Interstate 475 and U.S. 23 reaches Exit 2, Ohio 25 north to Perrysburg and south to Bowling Green. U.S. 23 south combines with I-75 north to Exit 193. Photo taken 09/02/05. The left two lanes connect to northbound Interstate 75 as well as provide the continuation of U.S. 23 south. 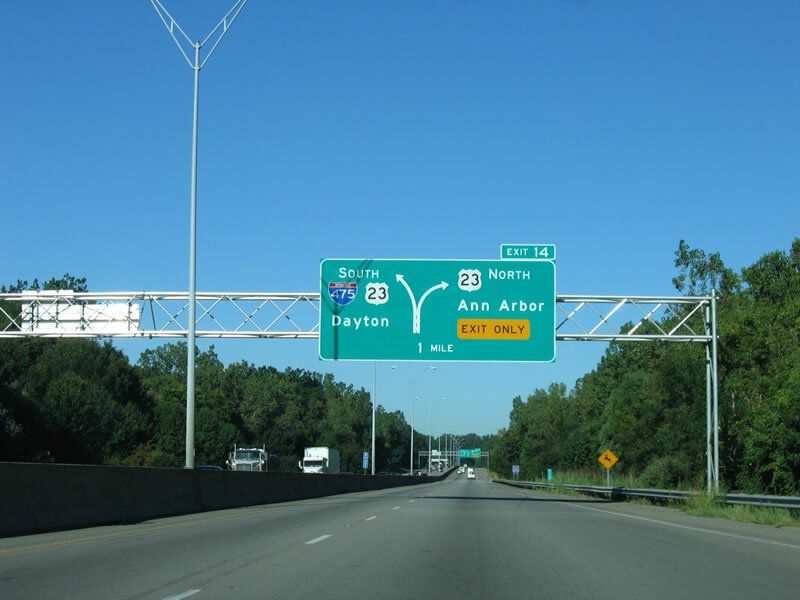 The right lane provides an exit to Interstate 75 south to Findlay, Lima, Dayton, and Cincinnati. Photo taken 09/02/05. Interstate 475 comes to an end at this point, as the ramps divide into the two directions of Interstate 75. Photo taken 09/02/05. Interstate 75 southbound at Exit 192 for the northbound beginning of Interstate 475, and the transfer of U.S. 23 from Interstate 75. Interstate 475 and U.S. 23 overlap for 14 miles, bypassing Toledo to the west. Photo taken by Adam Prince and Jeff Kitsko (06/08/02). Two miles from the separation with I-475 on Interstate 75 north. Photo taken by Steve Hanudel (07/04/06). Within one mile of the Interstate 475/U.S. 23 interchange on Interstate 75 northbound. Photo taken by Steve Hanudel (07/04/06). Entering the three wye interchange (Exit 192) with Interstate 475 & U.S. 23 north to Maumee and Ann Arbor, Michigan. and Steve Hanudel (07/04/06). I-475 departs from the left side of Interstate 75 north and combines with U.S. 23 north just ahead of Ohio 25 at Perrysburg. U.S. 23 north overlaps with I-75 to the ensuing exit, where it joins U.S. 20 to Stony Ridge and Lemoyne. Photo taken by Steve Hanudel (07/04/06). Photo taken by Dan Garnell (01/22/03). "Central-To-Monroe Leg Of New U.S. 23 Opened In Full-Dress Ceremony—Then Closed To Traffic." Toledo Blade, November 3, 1962. "Two New Ohio-Michigan Links Climax Decade Of Highway Plans." Toledo Blade, December 27, 1959. "2 Curved Bridges Designed To Carry Interstate 475 Over Maumee River." Toledo Blade, October 29, 1962. "$6.6 Million I-475 Bypass Opening Near." Toledo Blade, October 19, 1966. "Two Most Exciting Years Forecast By Rhodes At I-475 Link Dedication." Toledo Blade, November 21, 1968. "Section Of I-475 To Be Done Soon, But It Won&apos;t Be Open Until Summer." Toledo Blade, September 12, 1969. "Bids Due June 17 On I-475 Stretch." Toledo Blade, May 30, 1969. "Expressway&apos;s Opening To Bring Some Relief, Some Headaches." Toledo Blade, December 4, 1970. "Taft plan would widen I-75, I-475." The Toledo Blade, August 7, 2003. Page updated February 1, 2016.